Cathy Tomm Quilts: WIP what am I doing? 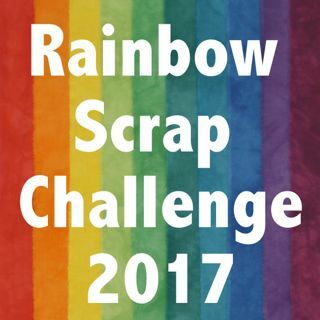 I have been working on my scraps still for the rainbow scrap challenge. Green spools for the month of April and Blue spools for the month of May. June is Yellow I hope to have some to show you soon. Yes I am a little behind. But I am back. The past two months have been crazy busy with lots of Agility, gardening, long arm quilting, just about everything but sewing for me. 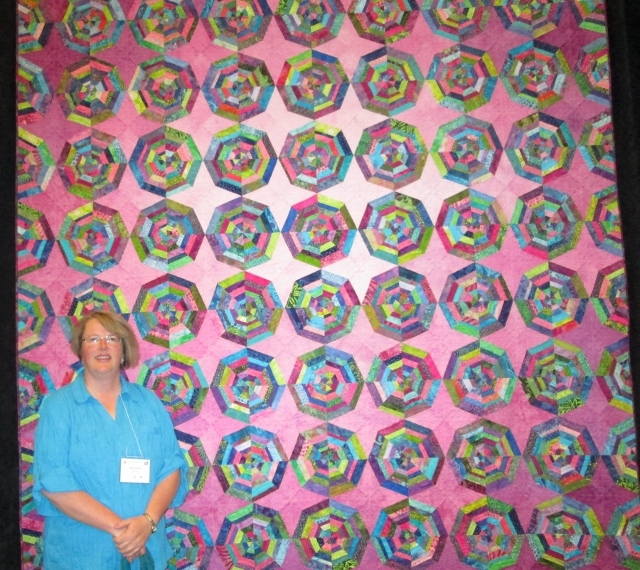 Last month the Canadian Quilters Association CQA had a conference and the National Juried show. 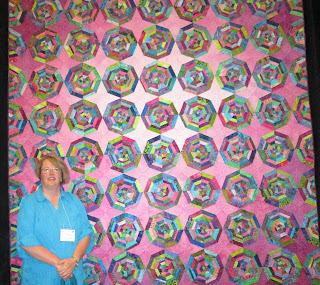 My quilt Wed Design 1.0, was in the National Juried Show. Here is a photo of me in front of my quilt. Mom and I and friend Liz had a great time at the show, bought lots of new fabric. I guess I should get some better finished photos someday. I would love to take it outside and do some on location shots but it is raining and is wet again. This Saturday the Leduc guild is having a Quilt till you wilt day. Should be good fun. Not sure which quilt I will take to work on. Maybe one of the Bonnie Hunter mystery s I have yet to complete. 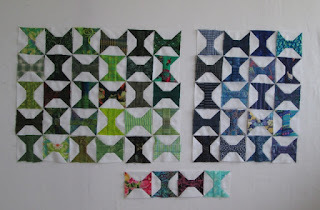 I have added this post the linky page over at The Needle and Thread Network WIP. That's some big, bright, bold quilt, Cathy! Well done! What a beautiful quilt and a wonderful photo of you! I'm working on Bonnie's new mystery quilt in Quiltmaker and posted about it today. Hi Cathy - nice to see you again! Great spiderweb quilt - it looks huge! The spools are awesome! Very nice. Congratulations on entering a quilt show. Great collection of spools too. Sometimes life keeps us busy, but quilting is a patient hobby, it will wait until things settle down.